Line from the Movie: "You've never heard of Peter Cottontail? Great chattering chick-chicks!" Narrated by Seymour S. Sassafras (Danny Kaye), Here Comes Peter Cottontail, a 1971 stop-motion TV special produced by Rankin-Bass, relates the story of how Peter Cottontail (Casey Kasem) became the Easter Bunny. It all started when Col. Wellington Bunny (Kaye again), the head honcho of April Valley, announced his retirement. He immediately offered the position to Peter, an appointment that was challenged by Irontail (Vincent Price), an evil bunny with an iron rattle where his tail used to be (he lost his real one in an accident involving a child on roller skates). To settle this dispute, a contest is held to see which rabbit, Peter or Irontail, can give away the most eggs on Easter morning. Unfortunately, Peter, who was out late the night before, sleeps right through Easter (the fact that Irontail tampered with his alarm clock didn’t help matters either), and as a result, Irontail is declared the winner, making him the new Easter Bunny. All is not lost, however, because Seymour Sassafras has in his possession a time machine, which he calls the “Yester-Morrowbile”. Piloted by Antoine (Kaye yet again), a caterpillar with a French accent, the Yester-Morrowbile will carry Peter back to Easter morning, giving him another chance to compete against Irontail. Naturally, Irontail, who’s been spying on Peter, has no intention of allowing this plan to succeed, and sends his pet spider off to sabotage the Yester-Morrowbile, thus ensuring Peter will never get his second chance. Here Comes Peter Cottontail is easily the finest “Non-Christmas” special Rankin-Bass ever produced, with Danny Kaye doing a good job in three separate roles and even belting out a song or two along the way (my favorite being the very catchy "If I Could Get Back to Yesterday"). Vincent Price is at his devilish best as Irontail, providing the story with a villain you enjoy rooting against, and as a kid I loved the entire sequence in the Yester-Morrowbile, where Peter and Antoine lose control and find themselves crash-landing in pretty much every Holiday except Easter, including Mother’s Day, the 4th of July, and even Christmas. Refusing to quit, Peter tries disguising his eggs so that he can give them away in whichever Holiday he happened to be in; during the 4th of July, he paints them red, white, and blue and tells a couple of kids they’re actually firecrackers! 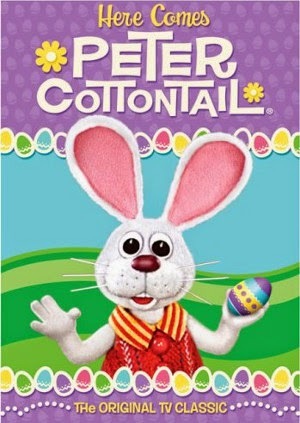 Doing for Easter what Rudolph, the Red-Nosed Reindeer did for Christmas, Here Comes Peter Cottontail is a whole mess of fun.